At 2:21 p.m. on December 6, 2011 the sun will set in Point Hope. Of course, in most places, the sun will rise again the next day. This is not the case here. The sun will not rise again until 1:56 p.m. on January 7, 2012. This afternoon, I could see the most beautiful pink and orange reflection out my kitchen window. The sunset and the ocean called to me. It was 12 degrees out with just a light wind, tolerable with my down jacket, mittens, face mask, and snow boots. The colors in the sky were magical. 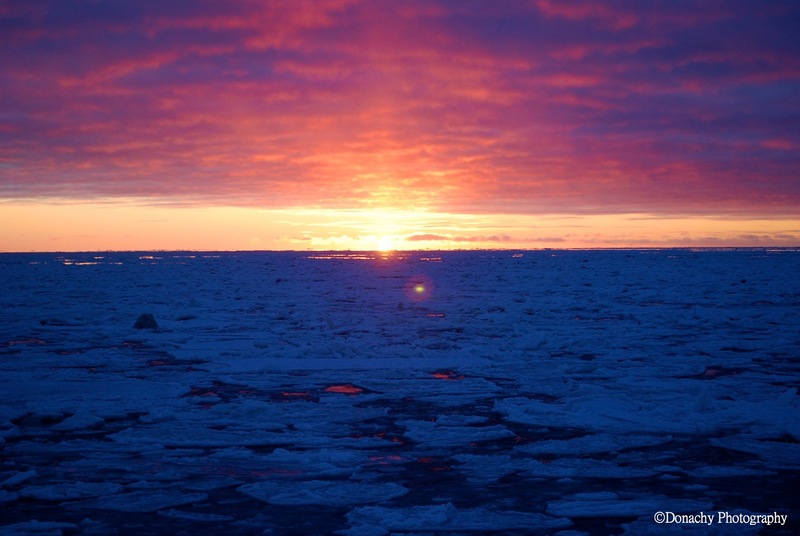 Swatches of blues and pinks hovered above the icy sea washed with an electric orange glow. The snow leading to the beach was pristine except for scattered caribou prints. Seven foot cliffs of packed snow loomed over the eroded beach. The edge of the ocean was covered in undulating sheets of ice showing only patches of open sea. The frozen crust lifted and fell slowly as the ocean below it was beginning its winter slumber. In California, I used to visit the coast in order to replenish my energy. The foaming and crashing sea along the West Coast always rejuvenated me, especially when my spirits were low. The Arctic Ocean imbues a person with a sense of calm and peace. As I looked to my left and right up and down the icy beach, others, too, were taking in the view.